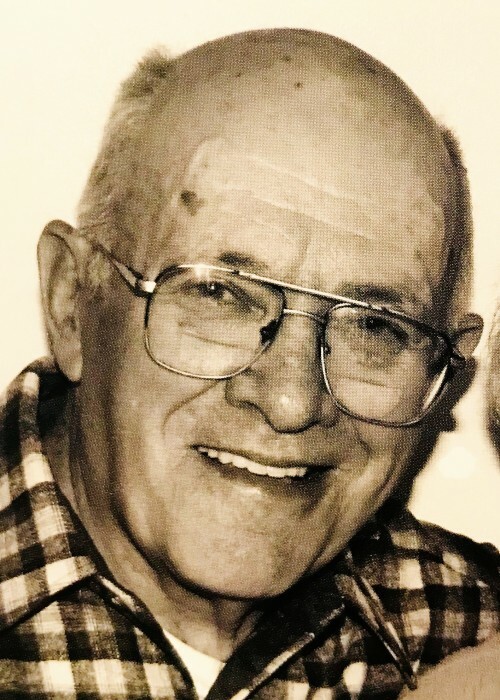 Nelson J. Bessette, 92, of 307 Town Line Road, Canton, went to live with the Lord on Tuesday, November 27, 2018 at the home of his daughter, Nancy, also on the Town Line Rd. Calling hours will be held Friday, Nov 30 from 2-4 and 7-9 pm at the O'Leary Funeral Home in Canton, NY. A Mass of Christian Burial will be held on Saturday, Dec 1 at 11am, at St. Mary's Church in Canton; with burial following in St. Mary's Cemetery, Riverside Drive, Canton. Born on April 22, 1926 in Pyrites, NY, oldest child of John B. (Bert) and Nora Warren Bessette, Nelson graduated from Canton High School in 1944. Nelson married the love of his life, Rogene J. Coughlin on December 6, 1952 at St. Mary's Rectory in Canton, NY. They were married 65 years. Rogene passed away December 10, 2016 after succumbing to Alzheimer’s. Nelson was a trucker, hauling pulp for several years, and he hauled milk to the Queensboro Milk Plant on Gouverneur Street in Canton for over 25 years. He retired from hauling milk when farmers installed bulk tanks. Nelson and Rogene owned and operated their dairy farm on the Town Line Road from 1952 until 1986 when Nelson retired from dairy farming. They remained on the farm where Nelson continued with his passions of cutting hay, cutting wood and making maple syrup. He loved to be outside working. He was a member of the Knights of Columbus, a Communicant of St. Paul's Church in Pyrites and later, St. Mary's Church, Canton. He was a Grange Member, and a member of the Stone Dam Hunting Club & State Land at Stone Dam; Little Stillwater (South Colton) hunting club and the Kelly Club (Russell). In addition to hunting, Nelson enjoyed bowling, snowmobiling, playing cards and dancing. He is survived by three sons: Thomas N. (Jeanette) of Hermon; Timothy G.; Milton J. (Connie) of South Russell; and four daughters Susanne M. (Stanton, Jr) Smith, and Nancy Bessette of Canton; Rosemary K. (John) Langey of Cazenovia, Jorja C. (Michael) Christy of Canton. One brother: Warren Sr (Betty) of Canton; two sisters: Norene (Neil) Sheridan of Canton; Elevene (Jake) Corbine of Russell. Two sisters-in-law: Susan Bessette and Louise Coughlin. 19 grandchildren: Bryan and Mark Smith; Reardon Bessette, Brandi Stead, Brooke Roberts, Bobbie Kitts, and Bethany Allen; Melissa Rivers; Brent, Craig and Devin Robert; Jeremiah Bessette, Shandelle Clifford; Benjamin and Madison Langey; Nathan, Katherine, Thomas and Daniel Christy. Nelson also had 36 great­grandchildren and numerous nieces and nephews whom he loved and enjoyed. Nelson was predeceased by his parents, wife, Rogene, son, Roger D, his brothers: Reardon, Burton Sr, and Gerald Sr, his sister: Anne (Bessette) Scott, brother and sister-in-law Herbert and Naomi Haven, brother-in-law George Coughlin and one nephew, Jere Haven. Donations in his memory can be made to St. Mary's in Canton, Knights of Columbus or charity of one's choice. Memories and condolences may be shared online at www.olearyfuneralservice.com.